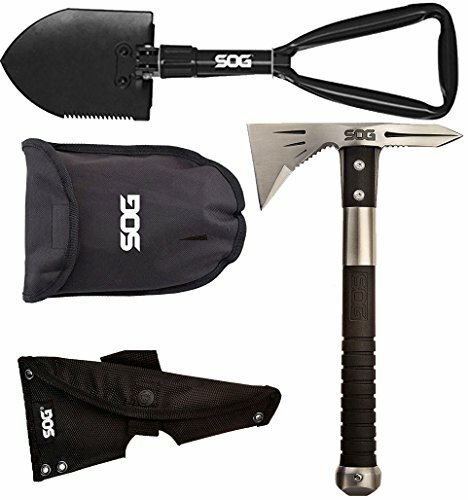 SOG Specialty Knives & Tools F08-N Entrenching Tool is made of High Carbon Steel with a length of 18.25 inches and weight of just 24.5 ounces. A folding shovel can be an indispensable tool in today's constantly changing environment. When you need to move sand, dirt, or snow, a shovel is the best hand tools to have. SOG's all steel constructed entrenching tool uses a tempered steel blade with teeth cut into one side for cutting and slashing. The blade can be rotated 90 degrees to reveal a pick or to be used as a hoe with the shovel blade. Rotate the blade a full 180 degrees to use the pointed end of the pick in a straight manner. The triangular handle is strong and fits comfortably in either hand. When folded, it takes up about the same space as a stack of paper plates. The SOG F08-N Entrenching Tool comes with a limited lifetime warranty that protects against defects in manufacturing and materials. SOG products have also won favor among law enforcement, military and industrial customers that rely on their tools to perform flawlessly in the toughest, most adverse conditions. The original SOG Voodoo Hawk was designed as a combination of our tactical Tomahawk and FastHawk. This Voodoo Hawk Mini is smaller and lighter while featuring the same components; an extended cutting head, spike for piercing applications, compact glass-reinforced nylon handle, and metal pommel cap. The Voodoo Hawk Mini has everything the Voodoo Hawk has but in a smaller, compact form making it great for outdoor travelers like backpackers, hikers, hunters, or paddlers with a durable nylon carry sheath. The durable glass-reinforced nylon handle can take a beating while still remaining strong. Great tool for anything you can throw at it. If you have any questions about this product by SOG Specialty Knives Multi, contact us by completing and submitting the form below. If you are looking for a specif part number, please include it with your message.